Over the last few years, IMAN’s Community Café has become a unique and powerful site where art and organizing come together to inspire and empower audiences on a regular basis. The May edition, Community Café: ReEntry, did not disappoint on either account. 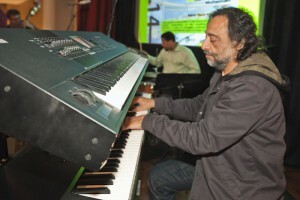 The Egyptian producer, composer, arranger and pianist Fathy Salama, who is the Arab World’s Only Grammy and BBC Awards Winner, and his band headlined the night with a set that layered their traditional Arabic and Jazz influences to create an eclectic soundscape. 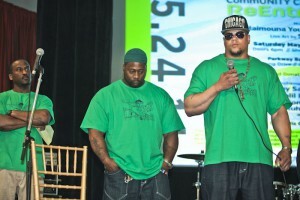 In the same manner, IMAN brought together music and stories from its G reen ReEntry leaders and organizing partners to highlight this unique and effective solution to the problems of recidivism and unemployment faced by those re-entering society. Honoring the long struggle against mass-incarceration and the week commemorating the birth of Al-Hajj Malik Al-Shabazz, this Community Café was dedicated to the artistic exploration of the multifaceted story of ReEntry; a story of struggle, redemption and in many cases an inspirational story of hope and transformation. In addition to Fathy Salama, it featured the always-powerful spoken words from Mark Gonzales, and music from Muhsinah, Khalil Ismail and the host, Maimouna Youssef. Live art by graffiti and fine artist, graphic designer, and professional television animator Slang was a special treat that night. This Café was special for two other reasons: (1) Presenting the energetic “house band” that featured some of the talented brothers from the first Green ReEntry Home, and (2) Articulating important legislation that impacts thousands of brothers and sisters re-entering society. Leaders from IMAN and our partner organization, Target Area Development Corporation, spoke about the importance of citywide alliances like the United Congress of Community and Religious Organizations (UCCRO) working to provide real solutions to unemployment, lack of dignity and recidivism that continue to be huge factors for many from the formally-incarcerated community across Chicago and Illinois. 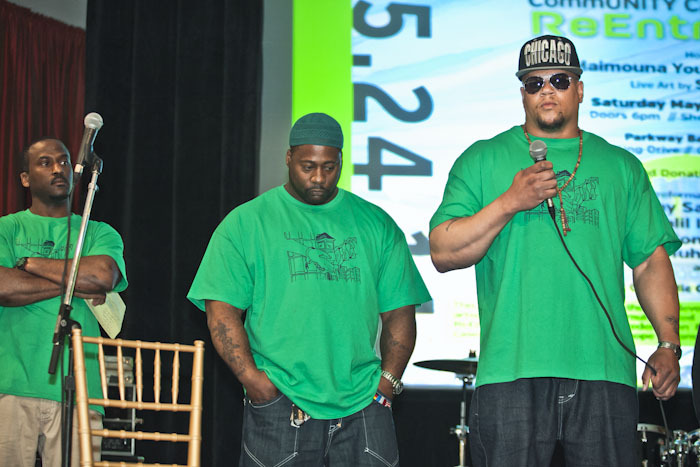 In addition to the music they performed, leaders from Green ReEntry spoke about an important piece of legislation that allows businesses to receive a tax credit for hiring ex-offenders, which IMAN helped to pass along with UCCRO. This entry was posted in Arts & Culture, Organizing & Advocacy by Shamar Hemphill. Bookmark the permalink.